The most famous lava flows on the Moon are in western Mare Imbrium, but the flow with the best imaged details is this remarkable one on the rim of the farside crater Wiener F. In 1971 Dale Cruikshank and I included this photo in a paper on lunar lava channels and tubes. Here is what we said about this flow feature: The leveed channel leads downslope from the crest of the inner rim of the smaller nested crater to a large pool of lava. Flow patterns in the lava pool are clearly visible. By later in the 1970s a change in interpretation occurred as impact melted rocks became widely recognized. Instead of being lava flows deep in the farside highlands this flow and pond are now considered to be impact melt created during the formation of Wiener F, the 30 km crater whose northern rim is shown here. On a Clementine false color image the ponded flow is the same red color as surrounding highlands, showing that it is not a mare type lava but is more likely to be a melt of highlands rocks. One more proposed case of highlands volcanism bites the lunar dust. 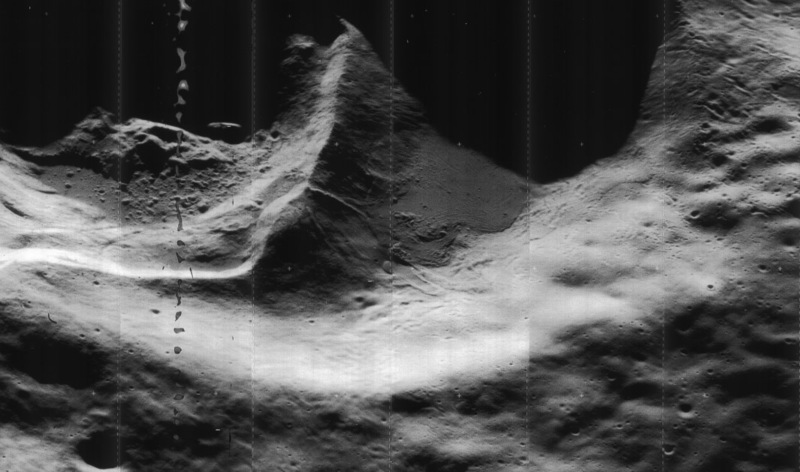 The entire Wiener F crater for context. Click the Lunar Orbiter image on that page to see the enlargement. Cruikshank, D. P. & Wood, C. A (1972) Lunar Rilles and Hawaiian Volcanic Features: Possible Analogues, Earth, Moon, and Planets, Vol. 3, p.412.